This step card I made for my niece's birthday who turned 7 last week! 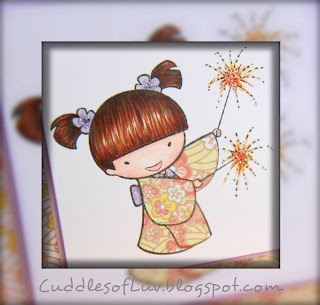 Her birthday is the day right after July 4th, so Kiyoko holding sparklers was perfect! Kiyoko's kimono is paper-pieced with some washi paper, and matched the card with the same paper. It also has a CC Cutters Cupcake, cut with some paper scraps. The tag has a birthday message for the birthday girl, and can be tucked into a hidden pocket on the back of the last step. 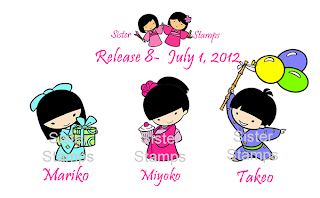 ATS store carries all the Sister Stamps, including the newly released Mariko, Miyoko, and Takeo! Stop by the ATS Challenge blog to see more inspiration from the team! Be sure to follow the simple rules, and you may be the lucky winner of 5 CC Designs Digi stamps! so cute! i love her kimono and beautiful coloring on her hair! Sooooo cute. Her kimono is pretty too. so cute! great coloring and love the image too. hope you have a good weekend coming up! Super cute Mimi! 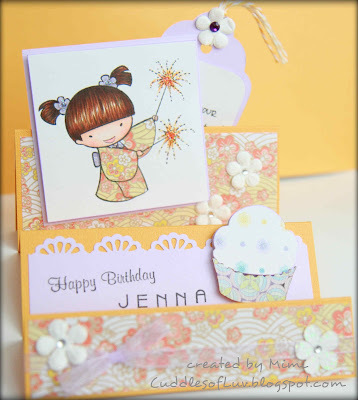 Love the soft colors and the card technique! Hope you're having a great weekend! Adorable step card, Mimi!! Love the soft colors and paper piecing!! The papers are perfect!! Kawaii!!! I love the colors you chose and she's colored so prettily! I bet your niece loved her one of a kind card.